Make sure you have completed the following steps by going through the checklist below. Refer to the quick start-up guide in case you have missed a step. If the quadcopter is not behaving as expected, you can check out the Troubleshooting section for solutions to general issues. Step 1: Install the required tools. Install Steam and Steam VR. Install RCbenchmark Tracking Lab and activate the license. Install PuTTY (optionnal, we recommend to connect to the quadcopter with a browser and Cloud9). In case of any issues, follow the complete tools installation guide here. Step 2: Setup the network. Plug the ethernet cable from the router to the main computer and connect the router to the power supply. Check the connection on the computer and set the connection to private network. Complete assembly guide for the router can be accessed here. Step 3: Install the base stations. One of the base station should be in mode b and the other in mode c.
Ensure that the LED lights on the base stations are green. In case of any issues, click here to go through a comprehensive base station setup guide. Step 4: Install the Otus Tracker on the Quadcopter. Fix the vibration dampening base on the Quadcopter as explained, then fix the Otus Tracker on the base with double sided tape. For reference you can visit the page, General Assembly for a visual instructions. Connect the Micro USB to the Otus Tracker. Step 5: Power the Raspberry Pi with the Battery. Ensure that the TX60 connector is firmly connected to the battery. Development Mode: In case you are developing a program to be run on the raspberry pi and dont need to power the motors, use the micro-usb slot on the Raspberry Pi to power up only the Raspberry Pi and Pixhawk. Step 7: Launch RCbenchmark Tracking Lab and Stream the position data. Confirm that the Otus is tracked by the Tracking Lab software. Go to the server tab and enter the IP address of the Quadcopter. Enter the port number 5401. The LCD screen should display: Receiving Data! Incase of any issues with transmitting data, follow the RCbenchmark Tracking Lab instructions. Check that the QGroundControl is connected to the Quadcopter. If not, follow the connection instructions. The quadcopter is now ready for flight. Install the drone in an area protected with nets. Although it is unlikely, assume that the quadcopter throttle can be turned on to 100% at any time once the battery is connected. Check that all components of the quadcopter are firmly secured, including the screws. Launch Qground control. Set the configuration options. Launch RCbenchmark tracking lab and set the correct server options and launch the server and stream the data. The server can also be launched after the Otus quadcopter has been powered. Connect the PS4 controller to the computer. The joystick has to be connected to the computer with Qgroundcontrol through USB. When done correctly, a new joystick tab will appear in Qgroundcontrol. Please activate "Advanced settings" and Deadbands. The deadband is configured during calibration. It will reduce woble due to the joystick at hover. You have two options for throttle zero. We recommend to activate "Full down stick is zero throttle". With this option, it will not be possible to accidentaly arm the quadcopter by pressing the arm button by accident. The throttle stick has to be push down for the quadcopter to arm. To arm the quadcopter, hold the throttle stick to the bottom and press the arm button. To disarm the quadcopter, hold the throttle stick to the bottom left. Once airborn, the quadcopter should only need very light inputs from the right stick to correct for drift. Many beginner pilots tend to overcompensate. If you feel you are loosing control, the best course of action is to cut the throttle and disarm the drone. Do not try to keep the drone in the air unless you feel you know how the drone is orientated and how much to compensate. Keep the drone in the same orientation relative to you to prevent disorientation. We recommend that you learn to fly the drone manually with very gentle manoeuvers for 3 to 5 battery packs. This will give you a feeling of how responsive the drone is. It will also be easier for you to tell if the drone is behaving properly when you will work with automated flight mode. Once you quadcopter works well manually and you can confirm tracking during the flight, you are ready to fly in position hold. 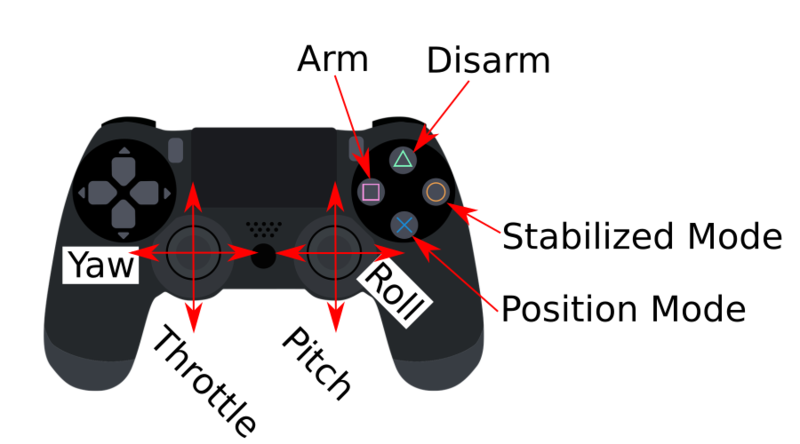 Land the quadcopter and switch to Position mode with the PS4 controller. Slowly increase the throttle until the quadcopter takes off. Position hold is actually a confusing term. When the roll and pitch sticks are centred, the quadcopter is in position hold. When roll or pitch sticks are offcentered, the quadcopter is in velocity mode. The velocity mode can be quite aggressive. The quadcopter will attempt to reach a velocity of MPC_XY_CRUISE for a full pitch forward stick. Given that the test environment is small and that the default MPC_XY_CRUISE is 5 m/s, a full pitch forward command may result in a quadcopter in your safety nets!